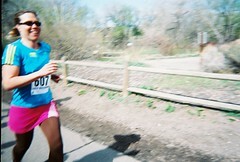 On Sunday, Jenny & I ran the Horsetooth Half Marathon in Fort Collins, CO. It was foggy in the morning, but the fog lifted just before the race. We were blessed with perfect running weather, sunny and cool with no wind. I ran the race in 1:49:00 (8:19 minutes per mile pace); which was good enough for 15th place out of 141 gals in my age group. 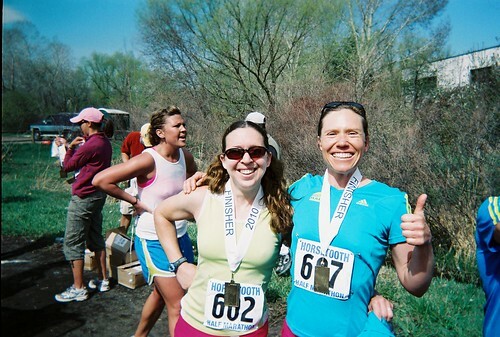 Jenny sprinted to the finish about 10 minutes after I was done. I just barely had enough time to get the camera (we had hidden it the night before). As I was walking to an open spot amongst the crowds, I saw a pink skirt and a blonde pony tail…It was Jenny! I ran like a maniac through the crowd and managed to capture these pictures. Classic! After 8 months of pseudo-parenting, the job came to an end. More abrubtly than it started. We had 5 days notice of the onset, but only 48 hours for the conclusion. Irreconcilable Differences. C’est La Vie. 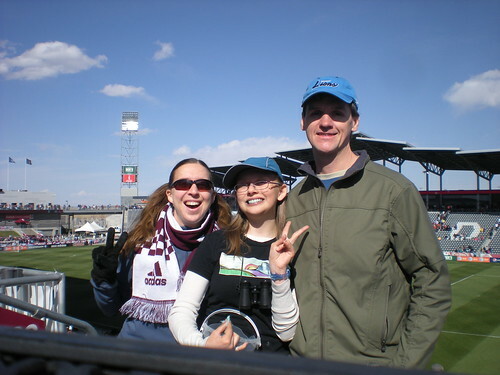 Colorado Rapids Opening Game – Dennis Birthday Kickoff! 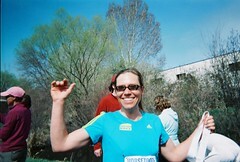 You are currently browsing the climbergirl blog blog archives for April, 2010.